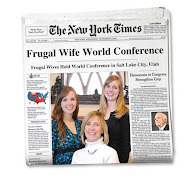 Frugal Wife = Wealthy Life: And the Winners are. . . ! And the Winners are. . . ! Just like you, I got a ton of GREAT frugal ideas from your many comments last week during our Week of Giveaways! I enjoyed reading how clever, thoughtful and frugal you all are when it comes to gift giving. I'm sure there will be many of us who make these ideas our very own during the coming holiday season. And now the moment we've all been waiting for (just a reminder that the winners were chosen randomly -- we could never have chosen a favorite comment). The winner of last Monday's giveaway (Dave Ramsey's Personal Finance Software) is Tristen! She answered the question, "How do you and yours keep to your budget through the highly commercialized holiday season?" Her winning comment read: "This year we have been better during the summer at putting our extra income that really comes only in the summer into our savings so now we have money for Christmas Yay and NO credit card! We are going to sit down and write down an exact budget for it as well so we don't go spend more than we want." Great to see you planning ahead, Tristan, and making your money do what you want it to! Wednesday's winner had this to say when answering the question, "Tell us what gift you received in the last year that you loved most. "As a semi-late birthday gift, I got a baby boy! It's the gift that keeps on giving..." Hard to top that precious gift, Chrissie! You've won the Dave Ramsey DVD Cash Flow Planning -- you're going to love it! And last, but certainly not least, is our winner from Friday's question asking you to tell us about the best gift you've ever given. Saskia won the Dave Ramsey DVD Dumping Debt with her comment, "It's something I haven't actually given yet. I came across a poem that has turned into my favorite love poem ever. It doesn't feature very romantic language but to me it speaks of love. So I wrote it on the back of a beautiful card, and I'm giving it to my boyfriend on Monday (which is his birthday). I hope he likes it." Look at that! He receives your thoughtful gift and you win our giveaway, both on the same day!! OK, you lucky girls, shoot us an email with your contact information and we'll get your gifts on their way. Just in time for the holidays. Congratulations to the winners. This was great topic, and people had such good ideas.